Video Games Help You Live Out Your Dreams of... Working? Video games can help you live out your dreams. You can enter mystical worlds 6 Lesser Known Final Fantasy Games That Deserve A Playthrough 6 Lesser Known Final Fantasy Games That Deserve A Playthrough Take a look at some great games outside of the core Final Fantasy series, and find out if any catch your eye! Read More and do things that would be utterly impossible in the real world. Want to have a one-on-one fight where characters can shoot fireballs out of their hands? Street Fighter has you covered. Thinking about creating your own empire and taking it from ancient to modern times? Civilization V Why You're Playing Civilization V Wrong: Time For Multiplayer! Why You're Playing Civilization V Wrong: Time For Multiplayer! Basically, if you've never played Civilization against one or more real people, then you haven't enjoyed the game to its full capacity. Read More is for you. Some video games let you live out the ultimate fantasy. You know, going to work. 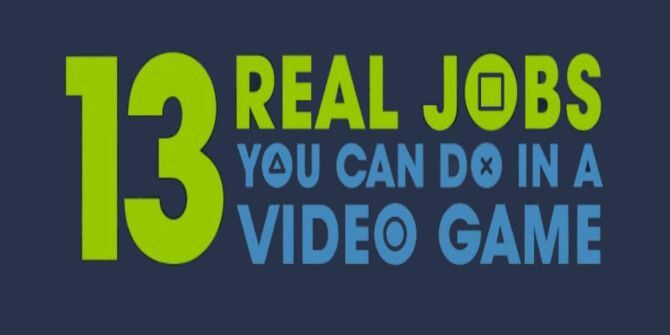 Seriously, the video games on the infographic below are all about letting you work regular jobs. They’re a dream come true!